【HIGH PRESSURE SHOWER HEAD 】-- Stronger water flow- create the feeling of the highest possible water pressure. Angle Adjustable - you can shift/move shower head to spray a certain direction to your liking. 【SELF-CLEANING NOZZLES 】-- 45 Nozzles blast out water at an incredibly high pressure- shower head can prevent lime and hard water deposits, easy to clean and maintain for the shower head high pressure. 【STURDY CONSTRUCTION 】-- Made from high quality ABS engineering plastics which makes it both lightweight and durable. 【EASY INSTALLATION 】-- Installs high pressure shower heads and Connects to universal G1/2 shower hoses just for few minutes,without plumbers or tools. 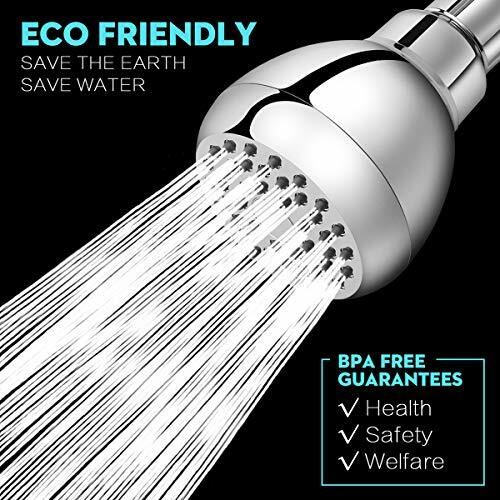 【WARRANTY 】 -- Limited Lifetime Warranty for all our WarmSpray shower heads high pressure,if you have any dissatisfaction about our shower heads, welcome feel free to contact us via Amazon.